In the world of the two suns, the time of the great changing is coming! While mighty armies clash, powerful mages with godlike powers unleash the forces of magic on the battlefield, pursuing their own mysterious goals. 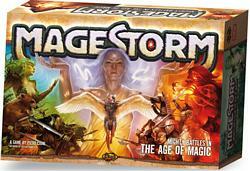 Magestorm, the first set of a new board game series of fantasy battles fought under the influence of powerful magic, is now available. While mighty armies clash, mages with godlike powers unleash the force of their spells on the battlefield, helping their mortal allies while pursuing their own mysterious goals. Victory only can be achieved by perfecting a strategy that balances magic-use with military skill.